The X-Files and Californication actor David Duchovny has been hired as the voice of a new marketing campaign for sofa specialists, Sofology. 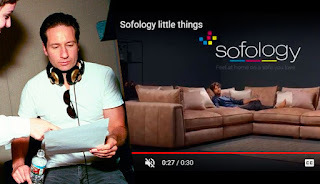 The ad campaign is dubbed "Little Things", and emphasizes the importance of choosing the right sofa - a piece of furniture that has an average lifetime of 7-10 years in the home. It takes a deep and closer look at the comfort and aesthetic components of a sofa, with the assistance of CGI. "Little things make life better. From the feel of rich velvet, to the beauty of intricate stitching details, we embed every one of our sofa ranges with these little things, because we know you can truly feel the difference. Coming home should feel special." The £22m campaign, created by independent creative agency, Brave, will launch on Monday 20th august I will also run across digital, social channels and be available to view in store.